*We now celebrate our EIGHTEENTH EDITION of The Lunch Circuit on Wednesday, November 14th at 11:30am-1pm. 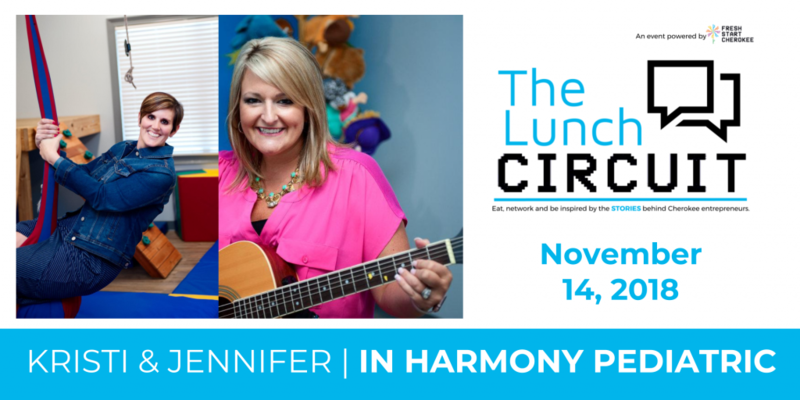 This time, we are excited to feature Cherokee County entrepreneurs from the Woodstock and Hickory Flat area, Kristi Estes and Jennifer Pucket of In Harmony Pediatric Therapy. With backgrounds and training in occupational therapy, speech and language therapy, music therapy, and therapeutic listening, Kristi and Jennifer joined forces to form a unique therapy spot for special needs kids, military, and more. Kristi and Jennifer take a unique approach to therapy using a host of different services including the power of music. They have built a successful therapy practice in Cherokee these last ten years, love their families, and have been recognized both locally and in Atlanta as top leaders under 40. We think you’ll love their story, passion, and dedication to a long-term vision.